Department of Geography (DoG) News and Events | Where it's at! 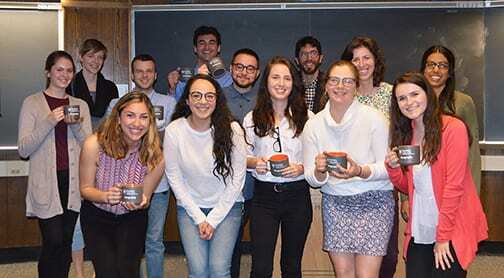 Undergraduate Research Opportunities Connection (UROC) researchers (holding their Coffee Hour mugs) and graduate student mentors after the undergraduate students gave presentations on their research at the April 12 Coffee Hour. Front row (left to right): Nicole Rivera, Julie Sanchez, Shelby Duncan, Samantha Matthews, and Talia Potochny. Back row (left to right): Meg Taylor, Michelle Ritchie, Hunter Mitchell, Sam Black, Cameron Franz, Zachary Goldberg, Jamie Peeler, Ruchi Patel. Learn more about UROC and how to get involved. Spring Commencement is May 3–5, 2019. The Graduate School ceremony will be on Sunday, May 5, at 6:30 p.m. at the Bryce Jordan Center. The Penn State Online Geospatial Program will have a small reception for MGIS and HLS (GEOINT) students and families on Sunday, May 5, 3:45 to 5:15 on the 4th floor of the Earth Engineering Science (EES) Buildling. If you plan to go, let Beth King know. The Coffee Hour lecture series has concluded for the spring semester, and will resume in fall 2019. To view archived webcasts of talks, use the calendar on our website to navigate to the date of the talk and click on the title to access the description and webcast link. Visitors to The Arboretum at Penn State now can explore the H.O. Smith Botanic Gardens with the Arboretum’s new, interactive Plant Finder. The map-based program allows users to find the locations of more than 1,100 species of plants in the Arboretum’s living collections. The American Association of Geographers congratulates the individuals and entities named to receive an AAG Award. The awardees represent outstanding contributions to and accomplishments in the geographic field. Formal recognition of the awardees occurredat the 2019 AAG Annual Meeting in Washington, D.C. during the AAG Awards Luncheon on Sunday, April 7, 2019. Stand changes brought on by fire exclusion have contributed to reduced resilience to wildfire in ponderosa pine forests throughout the western US. Growing recognition of how structural attributes influence resilience has led to interest in restoring more heterogeneous conditions once common in these forests, but key information about interactions between stand and fuel development in such stands is currently incomplete or lacking. Few contemporary examples of structurally restored old-growth ponderosa pine forest exist. We re-measured plots in the Beaver Creek Pinery (BCP), a remote site in the Ishi Wilderness on the Lassen NF in California, that were installed following a 1994 wildfire, to better understand forest and fuel succession over time. The BCP experienced four wildfires since 1900 that restored the structure to one believed similar to historical ponderosa pine forest. Stand-scale change in overstory and understory vegetation were quantified in 2016 by remeasuring and remapping six one hectare plots that were initially mapped in 2000, and landscape-scale change was evaluated by remeasuring circular plots systematically arranged across the BCP in 1998. Tree recruitment, mortality, and growth were measured and changes in tree group and gap size and structure were calculated. We also examined the relative performance of California black oak, a declining but important species valued by tribes for food and wildlife for habitat, to better understand how fire interval and severity maintain the conifer and oak mixture. Using data from the re-measurement, we modeled stand and fuel development over the next 30 years using the Forest Vegetation Simulator (FVS),in order to predict the type of fire and return interval that would be necessary to maintain the desired heterogeneous structure over time. Integral to the geographic discipline are cross-cultural analyses, many of which use languages outside of the researcher’s own. There are few analyses, however, that address issues of translation that are inherently geographic; namely, that language is understood as a manifestation of place and culture. This article argues that the results of environmental interviews must be interpreted through a lens that evaluates how the translation of a word, or even a concept, is understood differentially based on one’s sense of place. Interviews were conducted in three of the Etsha villages situated in the Okavango Delta, Botswana, comparing perceptions of changes in both the local area and the flooding regime. Findings show qualitatively and quantitatively how residents perceive environmental change in light of their residential histories and their production of place. These results highlight that environmental change in an area is perceived in the context of previous residences, including the length of time spent in residence and the environmental characterization of that place. The process of interviewing regarding such change, especially when translation is necessary, should therefore proceed by incorporating inquiries about previous residences and the environments of those areas to correctly contextualize environmental change in a particular area. Yanan Xin presents her poster on college football fan travel patterns in the Geographies of Media and Communication Specialty Group Poster Session. Hers was one of many Penn State Geography student posters at the 2019 AAG annual meeting in Washington, D.C., last week. Alan MacEachren was named a 2019 recipient of the Graduate Faculty Teaching Award. Sara Cavallo won the 2019 Nancy Brown Geography Community Service Award. The final Coffee Hour for the spring 2019 semester will be April 12. The speakers will be the Undergraduate Research Opportunities Connection (UROC) students presenting on their projects. An induction ceremony for the Gamma Theta Upsilon (GTU) geography honor society will also take place. The annual Department of Geography Recognition Reception will be held on Friday, April 26, 2019, third floor of the Walker Building. Come for refreshments and socializing, the graduate student poster session, and a program where awards and accomplishments are recognized and celebrated. Alan MacEachren, professor of geography in the College of Earth and Mineral Sciences, and Esther Prins, professor of education in the College of Education, have received Penn State’s 2019 Graduate Faculty Teaching Award. The award, established in 1992 by The Graduate School, is presented to faculty members in recognition of outstanding teaching performance and advising of graduate students. As decision makers balance economic, environmental and social aspects of living, planners and others need decision-making tools that support the process, but do not dictate the outcomes, so that trade-off choices can reflect a wide array of needs, according to a team of researchers who looked at an interactive program using trade-off diagrams. Ground-truth datasets are essential for the training and evaluation of any automated algorithm. As such, gold-standard annotated corpora underlie most advances in natural language processing (NLP). However, only a few relatively small (geo-)annotated datasets are available for geoparsing, i.e., the automatic recognition and geolocation of place references in unstructured text. The creation of geoparsing corpora that include both the recognition of place names in text and matching of those names to toponyms in a geographic gazetteer (a process we call geo-annotation), is a laborious, time-consuming and expensive task. The field lacks efficient geo-annotation tools to support corpus building and lacks design guidelines for the development of such tools. Here, we present the iterative design of GeoAnnotator, a web-based, semi-automatic and collaborative visual analytics platform for geo-annotation. GeoAnnotator facilitates collaborative, multi annotator creation of large corpora of geo-annotated text by generating computationally generated pre-annotations that can be improved by human-annotator users. The resulting corpora can be used in improving and benchmarking geoparsing algorithms as well as various other spatial language-related methods. Further, the iterative design process and the resulting design decisions can be used in annotation platforms tailored for other application domains of NLP. 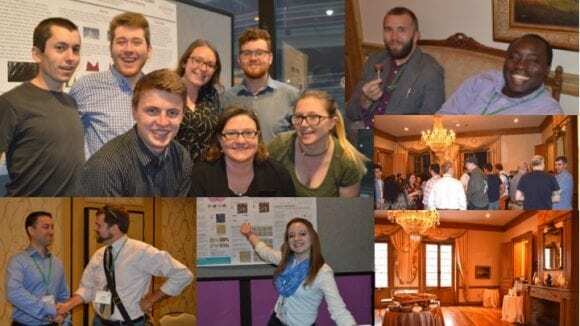 Scenes from AAG annual meeting in 2018, highlighting poster sessions, the alumni and friends reception, and advisers meeting their online students in person. Welcome to Jack Chang, a postdoctoral researcher affiliated with the ChoroPhronesis lab, starting in spring 2019. Welcome to Pejman Sajjadi, a postdoctoral researcher affiliated with the ChoroPhronesis lab, starting in spring 2019. Guido Cervone has been selected to receive the 2019 UCGIS Carolyn Merry Mentoring Award. The award presentation will take place at the 2019 UCGIS Symposium in June in Washington, D.C.
Saumya Vaishnava received the AAG-Energy and Environment Specialty Group data and field work award for this summer. Michelle Ritchie was awarded the Global Safety Office’s Wilderness First Aid Training Grant for her upcoming travel to Iceland. “Research Framework for Immersive Virtual Field Trips” by Alex Klippel, Jiayan Zhao, Danielle Oprean, and Jack Chang was awarded best paper at the KELVAR workshop. 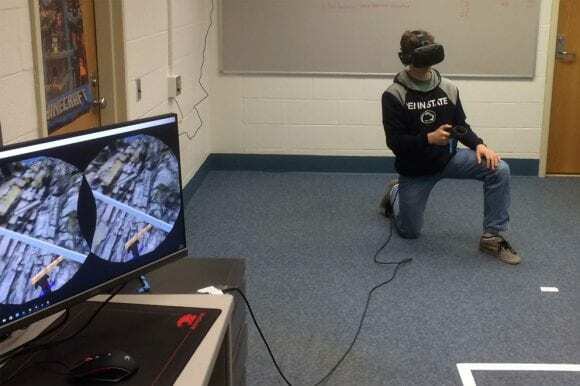 Alex Klippel’s course proposal for GEOG 170N Immersive Technologies: Transforming Society Through Digital Innovation was approved by the Faculty Senate. Joshua Inwood was interviewed on The Debate program on the France 24 English news channel about white supremacy in the wake of the attack in Christchurch, New Zealand. Weiming Hu’s entry was chosen as the third place winner of the Physical Sciences & Mathematics category in the 34th annual Penn State Graduate Exhibition. No Coffee Hour this week. The final Coffee Hour for the spring 2019 semester will be April 12. The speakers will be the Undergraduate Research Opportunities Connection (UROC) students presenting their projects. An induction ceremony for the Gamma Theta Upsilon (GTU) geography honor society will also take place. Nearly 100 current Penn Staters, including graduate and undergraduate students, faculty, and staff are participating in the AAG annual meeting, April 3–7, in Washington, D.C.
Several online geospatial program MGIS students will be giving their capstone presentations during the meeting. The Penn State Geography Alumni and Friends reception is planned for Friday, April 5, at 7:00 p.m. at Lillies. Virtual field trips have been thought of and implemented for several decades. For the most part, these field trips were delivered through desktop computers and often as interactive but strictly two-dimensional experiences. The advent of immersive technologies for both creating content and experiencing places in three dimensions provides ample opportunities to move beyond the restrictions of two dimensional media. We propose here a framework we developed to assess immersive learning experiences, specifically immersive virtual field trips (iVFTs). We detail the foundations and provide insights into associated empirical evaluations. Edited by the Antipode Editorial Collective. This essay calls for a “Manifesto of Radical Care” in Geography. The radical care that we advocate centres on non-dominant and intersectional forms of care (Lugones 2010) and challenges geographers to recognise different bodily experiences while being mindful of a commonality of vulnerability that stems from national or institutional policies and politics. This manifesto demands that geographers move beyond recognition into action, actively working to infuse radical care into our everyday interpersonal interactions and into our departmental, institutional and disciplinary policies and practices. The image shows the students taking part in a mapping activity during the 2018 event. SYWIG day is Thursday, March 21—Supporting Women in Geography’s annual Supporting Young Women in Geography (SYWIG) Day will be held on March 21, 2019. 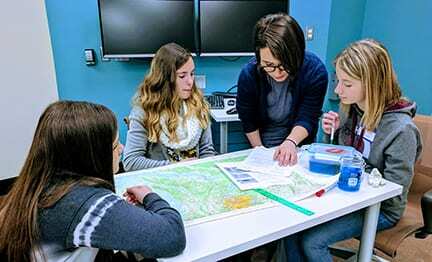 Seventh and eighth grade girls from Centre County middle schools Philipsburg-Osceola and Moshannon Valley will be visiting the department to participate in interactive workshops led by SWIG volunteers covering a range of topics in geography. 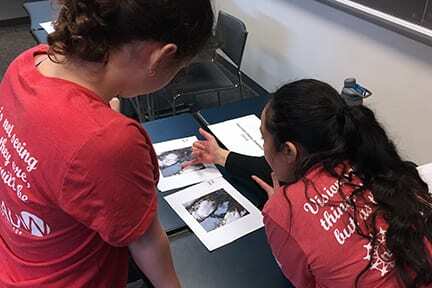 The event provides a unique opportunity to connect young women in the State College area and bring geography to life through creative activities led by Geography graduate and undergraduate students. Organizers of this year’s event are SWIG officers, Ruchi, Emily, Elham, and Michelle, with a special thanks to Stacey, Jamie, Julie, Jacklyn, Izzy, Elise, Emily, Sam, Erin, Tara, Saumya, Jodi and the office staff. Through this acknowledgment, SWIG endeavors to highlight the extraordinary service of women in the department every day. Welcome to Mamma Sawaneh, visiting scholar from The Gambia, working with Erica Smithwick this semester. 15th annual Penn State Powwow is scheduled for April 6-7. The Smith Center is pleased to announce that the twentieth series of the Kenneth Nebenzahl, Jr., Lectures in the History of Cartography will be held at the Newberry Library, Nov. 7 through Saturday, Nov. 9, 2019.To register or for more information, please contact Smith Center Program Assistant Madeline Crispell at crispellm@newberry.org or at (312)-255-3575. A 2014 report published by the National Bureau of Economic Research ranked American cities according to residents’ “happiness.” The results have surprised many people. This brings to a question that is closely related to resilience and sustainability research: are the happiest cities also most resilient to disasters? The answer to the question relies on how we measure community resilience. It’s May, 2016, and another drizzly day on the Chesapeake. I’m aboard Hōkūle‘a, the Hawaiian voyaging canoe circumnavigating the globe promoting a message of Mālama Honua, meaning “take care of the Earth.” I joined the crew in Yorktown, Virginia, for nine days of journeying in the Chesapeake Bay area, meeting with local Indian tribes and exploring environmental issues and solutions. An energetic man in his late fifties greeted us by switching off the lights and switching on a slide projector. “As we plunge into intellectual darkness, let me assure you that after this class, you will never be able to look at the world in the same way again. At least, I hope not.” In spectacles and a khaki field jacket, Peirce Lewis fit everybody’s idea of a geography professor. I have just spent a poignant afternoon browsing my correspondence with Peirce; hours sweet with nostalgia for an acquaintanceship that began when I joined the Penn State geography faculty in 1967 and grew into comradery; hours of sadness that his death brought that relationship to the definitive end. This paper proposes a methodology that integrates deep learning and machine learning for automatically assessing damage with limited human input in hundreds of thousands of aerial images. The goal is to develop a system that can help automatically identifying damaged areas in massive amount of data. The main difficulty consists in damaged infrastructure looking very different from when undamaged, likely resulting in an incorrect classification because of their different appearance, and the fact that deep learning and machine learning training sets normally only include undamaged infrastructures. In the proposed method, a deep learning algorithm is firstly used to automatically extract the presence of critical infrastructure from imagery, such as bridges, roads, or houses. However, because damaged infrastructure looks very different from when undamaged, the set of features identified can contain errors. A small portion of the images are then manually labeled if they include damaged areas, or not. Multiple machine learning algorithms are used to learn attribute–value relationships on the labeled data to capture the characteristic features associated with damaged areas. Finally, the trained classifiers are combined to construct an ensemble max-voting classifier. The selected max-voting model is then applied to the remaining unlabeled data to automatically identify images including damaged infrastructure. Evaluation results (85.6% accuracy and 89.09% F1 score) demonstrated the effectiveness of combining deep learning and an ensemble max-voting classifier of multiple machine learning models to analyze aerial images for damage assessment. Moisture delivery in California is largely regulated by the strength and position of the North Pacific jet stream (NPJ), winter high-altitude winds that influence regional hydroclimate and forest fire during the following warm season. We use climate model simulations and paleoclimate data to reconstruct winter NPJ characteristics back to 1571 CE to identify the influence of NPJ behavior on moisture and forest fire extremes in California before and during the more recent period of fire suppression. Maximum zonal NPJ velocity is lower and northward shifted and has a larger latitudinal spread during presuppression dry and high-fire extremes. Conversely, maximum zonal NPJ is higher and southward shifted, with narrower latitudinal spread during wet and low-fire extremes. These NPJ, precipitation, and fire associations hold across pre–20th-century socioecological fire regimes, including Native American burning, postcontact disruption and native population decline, and intensification of forest use during the later 19th century. Precipitation extremes and NPJ behavior remain linked in the 20th and 21st centuries, but fire extremes become uncoupled due to fire suppression after 1900. Simulated future conditions in California include more wet-season moisture as rain (and less as snow), a longer fire season, and higher temperatures, leading to drier fire-season conditions independent of 21st-century precipitation changes. Assuming continuation of current fire management practices, thermodynamic warming is expected to override the dynamical influence of the NPJ on climate–fire relationships controlling fire extremes in California. Recent widespread fires in California in association with wet extremes may be early evidence of this change. Within geography writ large, and economic geography in particular, there has been increasing interest in ‘engaged pluralism’ – defined by its proponents as lively and respectful engagement across theoretical, methodological, and topical lines – to increase diversity and build mutual respect among scholars. Drawing on feminist and postcolonial scholarship, we offer a sympathetic critique of engaged pluralism, grounded in a review of publishing trends in economic geography. Our findings reveal theoretical inertia around particular topics and paradigms, as well as low rates of publishing participation from women. We close with a discussion of engagement, reciprocity, and meaningful contact. Coffee Hour with Denice Wardrop | Fair election maps for purple PA | Longer drier fire seasons for CA? 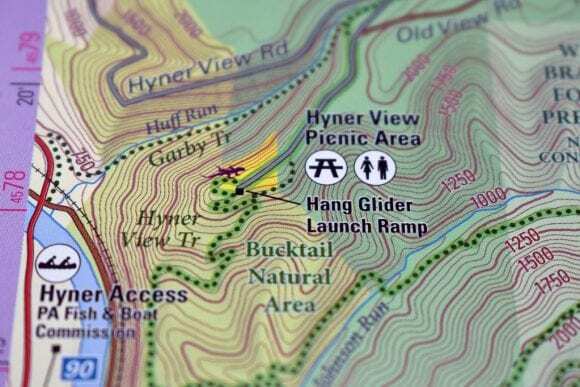 A detail from the new 2nd Edition of the Pine Creek Lizard Map—Grand Canyon of Pennsylvania. Purple Lizard Maps was founded by Penn State geography alumnus Michael Hermann (’95). Gregory S. Jenkins will give a brown bag talk on Wednesday, March 20 on “Natural, Human and Climate Change Drivers in Africa and the Need for Interdisciplinary Research and Communication,” at 12:30 p.m. in 158 Willard Building. Welcome to Cindy Etchison the new NRT Program Coordinator for Landscape U. A Penn State study on using VR for second language learning was featured in a news article in Campus Technology. The Institute for CyberScience is hosting its annual Symposium on April 1, which is free for Penn State faculty, staff, and students (and includes free breakfast and lunch). It’s at the Nittany Lion Inn, and the theme is Artificial Intelligence and Machine Learning in Science and Society. Learn more and register here: https://ics.psu.edu/events/ics-symposium-2019. Save the date: The Penn State Geography Alumni and Friends Reception during the AAG annual meeting is scheduled for Friday, April 5 at 7:00 p.m. at Lillies. More details to come soon. In most watersheds, as withdrawals for human needs increase, the ecological services provided by the same water are in decline. At a certain point, the value of water provided for human use is equal to the value of the ecological services, and beyond this point, ecological disruptions exceed the benefits of increased water extraction; this point is referred to as “peak ecological water.” In addition, the human and ecological benefits may occur at different spatial and temporal scales. Climate change may be shifting the point of peak ecological water in new and unpredictable ways, and two case studies provide insights into how those changes may be context dependent. Penn State Professor Christopher Fowler’s fall 2018 GEOG 421: Population Geography class won first place in the Higher-Ed division of the “Draw the Lines PA” statewide finals in February. For Fowler, the work on how to get better representation in Pennsylvania is just beginning. 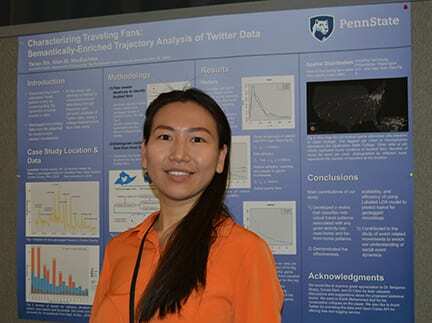 Penn State’s Social Science Research Institute (SSRI), in collaboration with the Institute for CyberScience (ICS) and the College of Information Sciences and Technology, has awarded over $100,000 in funding to support six new interdisciplinary teams of Penn State researchers whose work is aimed at developing innovative research programs using Twitter data. Before Chesapeake City at one end of the Chesapeake and Delaware Canal was named in 1839, the plantation site had been known as Bohemia Manor for more than two centuries, under the ownership of Augustine Herrman, a Bohemian who worked for the Dutch West-Indische Compagnie (WIC) in both Amsterdam and later New Amsterdam. Herrman marked its location on his magnificent map Virginia and Maryland as it is Planted and Inhabited this present year 1670. Koot explores the multiple intentions of the Herrman map from its origins as a manuscript initially commissioned by Philip Calvert in 1659 delimiting the boundary between Dutch New Netherlands and colonial Maryland to a far different map printed in London in 1673 as a piece of imperial propaganda celebrating possession of the broader Chesapeake. Social Network Analysis offers powerful tools to analyze the structure of relationships between a set of people. However, the addition of spatial information poses new challenges, as nodes are embedded simultaneously in network space and Euclidean space. While nearby nodes may not form social ties, ties may exist at a distance, a configuration ill-suited for traditional spatial metrics that assume adjacent objects are related. As such, there are relatively few metrics to describe these nuanced situations. We advance the burgeoning field of spatial social network analysis by introducing a set of new metrics. Specifically, we introduce the spatial social network schema, tuning parameter and the flattening ratio, each of which leverages the notion of ‘distance’ to augment insights obtained by relying on topology alone. These methods are used to answer the questions: What is the social and spatial structure of the network? Who are the key individuals at different spatial scales? We use two synthetic networks with properties mimicking the ones reported in the literature as validation datasets and a case study of employer–employee network. The methods characterize the employer–employee as spatially loose with predominantly local connections and identify key individuals responsible for keeping the network connected at different spatial scales. Gregory S. Jenkins will give a talk on Wednesday, Feb. 20 on “Natural, Human and Climate Change Drivers in Africa and the Need for Interdisciplinary Research and Communication,” at 12:30 p.m. in 158 Willard Building. Center for Landscape Dynamics Grad Award Lightning Talks rescheduled for Tuesday, Feb. 26, noon-1:30 p.m. in 319 Walker Building and the new due date for the Grad Award proposals is March 15. Two online geospatial program students, Danielle Barlow and Samuel Cook, have been selected as Student Assistants for the USGIF Symposium, the premier event of the geospatial intelligence business and profession, being held June 2-5, 2019, in San Antonio, Texas. Seth Dixon (’09g) curates a Geography Education ScoopIt topic page. Synergies between food production and nature protection—what are some ways forward for sustaining landscapes? Food insecurity is often addressed from an agricultural perspective, yet forests provide important and unique contributions to nutrition in many regions. The contributions of forests to nutrition are quite varied, flowing through surprisingly complex pathways. Furthermore, the extent to which the availability of nutritious forest foods depend on the type, amount, and configuration of forests is largely under-appreciated. Here, we explore some of the ways remote sensing can better characterize forest-nutrition linkages. People around the world paint their walls different colors, buy plants to spruce up their interiors and engage in a variety of other beautifying techniques to personalize their homes, which inspired a team of researchers to study about 50,000 living rooms across the globe. In a study that used artificial intelligence to analyze design elements, such as artwork and wall colors, in pictures of living rooms posted to Airbnb, a popular home rental website, the researchers found that people tended to follow cultural trends when they decorated their interiors. The Trump administration’s stated goal for a rule defining which wetlands and waterways get Clean Water Act protection: Write a simple regulation that landowners can understand. “I believe that any property owner should be able to stand on his or her property and be able to tell whether or not they have a ‘water of the U.S.’ on their property without having to hire an outside consultant or attorney,” acting EPA Administrator Andrew Wheeler told the Senate Environment and Public Works Committee in mid-January. But scientists who specialize in the study of wetlands and waterways say it’s not that simple. The global community decorates their homes based on personal decisions and contextual influences of their larger cultural and economic surroundings. The extent to which spatial patterns emerge in residential decoration practices has been traditionally difficult to ascertain due to the private nature of interior home spaces. Yet, measuring these patterns can reveal the presence of geographic culture hearths and/or globalization trends. In this work, we collected over one million geolocated images of interior living spaces from a popular home rental website, Airbnb (http://airbnb.com), and used transfer learning techniques to automatically detect the presence of key stylistic objects: plants, books, decor, wall art and predominance of vibrant colors. We investigated patterns of home decor practices for 107 cities on six continents, and performed a deep dive into six major U.S. cities. We found that world regions show statistically significant variation in decorative element prevalence, indicating differences in geographic cultural trends. At the U.S. neighborhood level, elements were only weakly spatially clustered and found to not correlate with socio-economic neighborhood variables such as income, unemployment rates, education attainment, residential property value, and racial diversity. These results may suggest that American residents in different socio-economic environments put similar effort into personalizing and caring for their homes. More broadly, our results represent a new view of worldwide human behavior and a new application of machine learning techniques to the exploration of cultural phenomena. In the built environment, places such as retail outlets and public sites are embedded in the spatial context formed by neighboring places. We define the sets of these symbiotic places in the proximity of a focal place as the place’s “place niche”, which conceptually represents the features of the local environment. While current literature has focused on pairwise spatial colocation patterns, we represent the niche as an integrated feature for each type of place, and quantify the niches’ variation across cities. Here, with point of interest (POI) data as an approximation of places in cities, we propose representation learning models to explore place niche patterns. The models generate two main outputs: first, distributed representations for place niche by POI category (e.g. Restaurant, Museum, Park) in a latent vector space, where close vectors represent similar niches; and second, conditional probabilities of POI appearance of each place type in the proximity of a focal POI. With a case study using Yelp data in four U.S. cities, we reveal spatial context patterns and find that some POI categories have more unique surroundings than others. We also demonstrate that niche patterns are strong indicators of the function of POI categories in Phoenix and Las Vegas, but not in Pittsburgh and Cleveland. Moreover, we find that niche patterns of more commercialized categories tend to have less regional variation than others, and the city-level niche-pattern changes for POI categories are generally similar only between certain city pairs. By exploring patterns for place niche, we not only produce geographical knowledge for business location choice and urban policymaking, but also demonstrate the potential and limitations of using spatial context patterns for GIScience tasks such as information retrieval and place recommendation. time and did not follow modeled least-cost pathways. The results suggest traditional modeling (e.g., least-cost path and agent-based models) underestimate travel time to safety. Thus, there is a need for additional outreach, notably in communities where traditional evacuation models might create a false sense of security. Wetlands are known to provide a myriad of vital ecosystem functions and services, which may be under threat from a changing climate. However, these effects may not be homogenous across ecosystem functions, wetland types, ecoregions, or meso‐scale watersheds, making broad application of the same management techniques inappropriate. Here, we present a relative wetland vulnerabilities framework, applicable across a range of spatial and temporal scales, to assist in identifying effective and robust management strategies in light of climate change. We deconstruct vulnerability into dimensions of exposure and sensitivity/adaptive capacity, and identify relevant measures of these as they pertain to the attributes of wetland extent and plant community composition. As a test of the framework, we populate it with data for three primary hydrogeomorphic wetland types (riverine, slope, and depression) in seven small watersheds across four ecoregions (Ridge and Valley, Piedmont, Unglaciated Plateau, and Glaciated Plateau) in the Susquehanna River watershed in Pennsylvania. We use data generated from the SRES A2 emissions experiment and MRI‐CGCM2.3.2 climate model as input to the Penn State Integrated Hydrologic Model to simulate future exposure to altered hydrologic conditions in our seven watersheds, as expressed in two hydrologic metrics: % time groundwater levels occur in the upper 30 cm (rooting zone) during the growing season, and median difference between spring and summer mean water levels. We then examine the spatial and temporal scales at which each of the components of vulnerability (exposure and sensitivity/adaptive capacity) shows significant relative differences. Overall, we find that relative differences in exposure persist at a very fine spatial grain, exhibiting high variability even among individual watersheds in a given ecoregion. For temporal scale, we find strong seasonal but weak annual relative differences in exposure resulting from a magnification of summer dry‐down combined with winter and spring wet periods becoming wetter. Sensitivities/adaptive capacities show significant differences among wetland types. A comparison between our anticipated hydrologic alterations under climate change and historical changes in hydrology due to anthropogenic disturbance indicates potential shifts in hydrologic patterns that are far beyond anything that wetland managers have experienced in the past. Learning a second language (L2) presents a significant challenge to many people in adulthood. Platforms for effective L2 instruction have been developed in both academia and the industry. While real-life (RL) immersion is often lauded as a particularly effective L2 learning platform, little is known about the features of immersive contexts that contribute to the L2 learning process. Immersive virtual reality (iVR) offers a flexible platform to simulate an RL immersive learning situation, while allowing the researcher to have tight experimental control for stimulus delivery and learner interaction with the environment. Using a mixed counterbalanced design, the current study examines individual differences in L2 performance during learning of 60 Mandarin Chinese words across two learning sessions, with each participant learning 30 words in iVR and 30 words via word–word (WW) paired association. Behavioral performance was collected immediately after L2 learning via an alternative forced-choice recognition task. Our results indicate a main effect of L2 learning context, such that accuracy on trials learned via iVR was significantly higher as compared to trials learned in the WW condition. These effects are reflected especially in the differential effects of learning contexts, in that less successful learners show a significant benefit of iVR instruction as compared to WW, whereas successful learners do not show a significant benefit of either learning condition. Our findings have broad implications for L2 education, particularly for those who struggle in learning an L2. 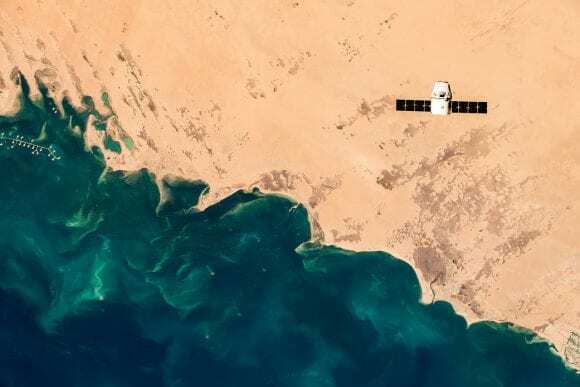 A key cartographic challenge associated with the rise of big data is to show when spatial data observations are missing or to communicate variables that indicate absence. For example, showing where people are tweeting during a disaster might be interesting, but visually identifying where normal signals are missing could in fact highlight the most affected places. Parcel data might be fully present, but attributes of their observations could convey qualities of absence (e.g., abandoned structures). Current geovisualization approaches normally do not show anything at all when data are missing or contain qualities of absence and only in rare cases might use a specific hue to highlight the presence of absence on maps. This work argues that people perceive missingness and absence in a way that is distinct from other spatial data qualities, and we propose a typology of static and dynamic means by which we can draw user attention to the presence of absence. To explore the application of these techniques, I use urban parcel data to visualize patterns of property blight in a Detroit neighborhood. Based on conceptual development and case study application, I propose research challenges to evaluate visual representations of missing and absent information on maps. Donald Trump’s agenda to build a “big” and “beautiful” border wall continues to raise alarms for anyone concerned with social justice and environmental well-being throughout the Mexico–U.S. borderlands. In this article, I examine how the border wall and its surrounding debates raise multiple issues central to political ecological and human geographic scholarship into governance across the organic spectrum. I focus particularly on a comparison of the different kinds of “border thinking” that frame these debates and that provide synergy for those coalitions dedicated to the preservation of diversity throughout the ecological and social landscapes of the Mexico–U.S. borderlands. Key Words: biodiversity, decolonial, feminist, Mexico–U.S. borderlands, neoliberal. Clio Andris will give a talk on “Representing Relationships and Social Life in GIS Models,” Thursday, Feb. 14, 1:30–3:00 p.m., 233B HUB-Robeson Center and streamed online. More details and registration info: https://www.eventbrite.com/e/representing-relationships-and-social-life-in-gis-models-tickets-54942114343. Chris Fowler’s fall 2018 GEOG 421 class took first place in the Higher Ed division in the “Draw the Lines PA” contest statewide finals. Imagine a world where space and time do not matter, where it’s possible to witness critical events in the history of the Earth and humankind, or have a sneak peek into the future. That’s what Penn State researchers, through the help of immersive technologies such as virtual reality (VR) and investments in the University’s infrastructure, are hoping to accomplish with a Penn State Strategic Plan seed grant. Penn State and Lightsource BP announced today (Feb. 5) the development of 70 megawatts of large-scale, offsite solar energy to support the University’s Strategic Plan, which cites stewardship of the planet’s resources as a key priority. The project to install large-scale solar arrays will provide 25 percent of Penn State’s state-wide electricity requirements over a 25-year term, while driving economic development and educational opportunities for the host community. Libraries have been the key to preserving culture and historic legacy for centuries. One such treasure cataloged in The Pennsylvania State University (Penn State) Libraries is a collection of over 33,000 Sanborn™ Fire Insurance Maps. Originally kept safe in metal drawers, the library has embarked on a journey to digitize this abundance of information, combine it with other media such as photographs, and make it accessible through a web interface. Inspired by these efforts, we accessed this information and took it to the next level. Using state of the art 3D modeling and immersive technologies, we created a historic 3D model and immersive experiences of Penn State, exemplarily for the 1922 campus. The resulting experiences can be accessed through the web but also through head mounted displays (HMDs) and mobile phones in combination with VR viewers such as the Google Cardboard. Additionally, they can be used anywhere in the world or on the campus itself as a way to enable remote and in situ experiences and learning. Immersive experiences let us connect to the past, the present and the future, and as such offer value to digital cultural heritage efforts. La Pyramide Inversée (The Inverted Pyramid), by architect I.M. Pei, is a skylight in the Carrousel du Louvre underground shopping mall in front of the Louvre Museum in Paris, France. 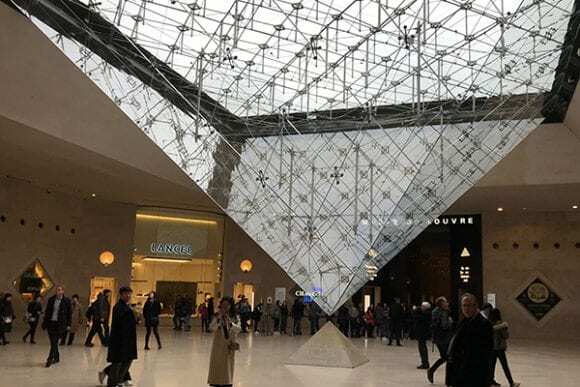 It is an upside-down and smaller version of the Louvre Pyramid, also designed by Pei. In the denouement of the film adaptation of The Da Vinci Code, the camera elaborately moves through the entire glass pyramid from above and then descends beneath the tiny stone pyramid below to reveal a supposedly hidden chamber and the sarcophagus with the remains of Mary Magdalene. Send your photos from field work and travel to geography@psu.edu. Stacy Levy, award-winning environmental sculptor (You may know her Ridge and Valley Sculpture in the H. O. Smith Botanic Gardens.) will give a talk on “The Shape of Water: An Artist works with Rain, Watershed, and Hydrology,” at 6:00 p.m. on Tuesday, Feb. 12, 2019, in 101 Agricultural Sciences and Industries Building and streamed online at https://psu.zoom.us/j/250545279. For more information, contact Kathleen Reeder at 863-8690 or kkr1@psu.edu. The Esri Mid-Atlantic User group is planning a one-day meeting on April 26, 2019 at Universities at Shady Grove, Shady Grove, Md. The general format of the meeting will include a plenary presentation in the morning with updates from Esri on the latest technology followed by breakout sessions with user presentations and, weather permitting, outdoor demos of field data collection technology. The organizers are looking for user presentations and one or more outdoor field data collection or other interactive outdoor demo(s) for the afternoon. If you would like to submit a presentation or demo for consideration, please send an abstract and your contact information to Sandy Woiak at Sandra.Woiak@fairfaxcounty.gov by March 1, 2019. Karen Schuckman, who teaches remote sensing and geospatial technology in the online geospatial education program, was a finalist for the 2019 Lidar Leader Award for Outstanding Personal Achievement. Qassim Abdullah, who teaches Unmanned Aerial System, photogrammetry, and remote sensing in the online geospatial education program, received the American Society for Photogrammetry and Remote Sensing Lifetime Achievement Award. Alan MacEachren has been awarded the 2019 Graduate Faculty Teaching Award. He will be formally recognized at the Faculty and Staff Awards ceremony on Tuesday, Apr. 12, 2019. No Coffee Hour this week. The next Coffee Hour is The Miller Lecture on February 15 with Judith Carney, Professor of Geography, University of California, Los Angeles. Her talk is titled, “Out of Africa: Food Legacies of Atlantic Slavery in the Americas.” For The Miller Lecture, special refreshments are offered starting at 3:00 p.m. in 319 Walker Building and the lecture begins as usual at 4:00 p.m. in 112 Walker Building. Interpersonal relationships are an important part of personal and public health, which makes understanding how to cultivate these connections important to improving health. Clio Andris, assistant professor of geography and Penn State Institute for CyberScience (ICS) associate, will discuss how geographic information systems (GIS) are helping to investigate ways of building communities that foster relationships and social life at the CyberScience Seminar. The session, which is free to the public, will be held from 1:30 to 3 p.m. on Feb. 14 at the HUB-Robeson Center. Both seasoned researchers and then-budding students remember the late Penn State professor Frederick Wernstedt for his contributions to geography. Wernstedt, who taught at Penn State from 1952 until 1986, explored the geography of Southeast Asia, an interest borne from his service there during World War II, which resulted in him writing a book that investigated the region’s migration and land use. He compiled information for World Climatic Data, a volume of data from nearly 19,000 stations. He oversaw the Department of Geography’s undergraduate program as an adviser and associate dean from 1972 until his retirement. He was a dedicated educator, receiving the Wilson Award for Excellence in Teaching from the College of Earth and Mineral Sciences in 1981. The diets of contemporary hunter-gatherers are diverse and highly nutritious, but are rapidly changing as these societies integrate into the market economy. Here, we analyse empirical data on the dietary patterns and sources of foods of three contemporary hunter-gatherer societies: the Baka of Cameroon (n = 160), the Tsimane’ of Bolivia (n = 124) and the Punan Tubu of Indonesia (n = 109). We focus on differences among villages with different levels of integration into the market economy and explore potential pathways through which two key elements of the food environment (food availability and food accessibility) might alter the diets of contemporary hunter-gatherers. Results suggest that people living in isolated villages have more diverse diets than those living in villages closer to markets. Our results also suggest that availability of nutritionally important foods (i.e., fruits, vegetables and animal foods) decreases with increasing market integration, while availability of fats and sweets increases. The differences found seem to relate to changes in the wider food environment (e.g., village level access to wild and/or market foods and seasonality), rather than to individual-level factors (e.g., time allocation or individual income), probably because food sharing reduces the impact of individual level differences in food consumption. These results highlight the need to better understand the impact of changes in the wider food environment on dietary choice, and the role of the food environment in driving dietary transitions. Chris Fowler’s fall 2018 GEOG 421 class took 2nd place in the category Higher Ed-Central in the in Draw the Lines PA contest. Judges’ statement: In their extensive outreach to fellow Penn Staters and others, the students in Chris Fowler’s Geography 421 class lived up fully to DTL’s hopes for how mappers might engage with their communities. 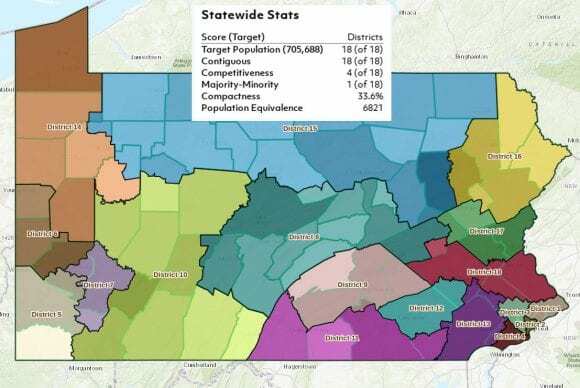 This group embodies the goal of Draw The Lines: to encourage Pennsylvanians to understand and engage in the legislative redistricting process and foster open discussion and debate about the competing values at play. The class began by assessing their own values, then created a survey and website to assess those of other students. They went to football games and other events to promote the survey, resulting in an impressive 247 responses from nearly every Pennsylvania county. The data showed that the respondents most value competitive districts and the class began to map with this as its to priority. The students presented their results in a nicely produced video essay, which candidly covered their failures, their strategies for dealing with urban vs. rural balance, and the impact of racial makeup on a district’s competitiveness. This winning entry demonstrates a top-notch collaborative and grassroots process, combined with a very decent map. The orientation/info session for UROC students has bee rescheduled for today, Jan. 29 at 7:45 p.m. in 319 Walker Building. The African Studies program is hosting a talk on “Morocco as a melting-pot: A case study of the transmission and evolution of knowledge and use of black magic” by Abderrahim Ouarghidi, assistant research professor, Office of International Program. The talk is Wednesday, Feb. 6, 12:30 p.m. in 158 Willard Building. Angela Rogers recently passed her qualifying exam for the Ph.D. program in Workforce Education and Development at Penn State. Alumnus John Frederick (’78) will hold a book signing and reading of his new book Winding Roads: A Bicyclists Journey through Life and America on Tuesday, Feb.12, 2019 at 6:30 p.m. at the Bellwood-Antis Public Library, 526 Main Street, Bellwood, PA 16617. (Snow date Feb. 14). Alumnus Siddarth Pandey (’14), CSMCCEP, has been promoted to associate. Pandey is an assistant production manager in the geospatial group at Dewberry. He is currently pursuing a masters in professional studies in geographic information systems at the University of Maryland, College Park. He earned a bachelor’s degree in geography from Penn State, and is a member of the Maryland State Geographic Information Committee. Alumna Lori Cohn Safer (’79) is President of the Seattle Chapter of the Appraisal Institute 2019, and a Content Reviewer for recently published book Real Property Valuation in Condemnation, Appraisal Institute, 2018. The goal of this presentation is to introduce a Science to Solutions activity at Arizona State University (ASU). ASU’s new Knowledge Exchange for Resilience (KER) aims to build capacity both within the university and to broader civil society to address real, current issues of community resilience. We conceptualize community resilience in broad terms, that is: in terms of people responding to profound social, economic, and environmental change. This might come in the form of shocks (disasters, economic crashes) but more often we look at it in terms of long-term stresses, like from vulnerability to hazards, or chronic poverty. For this, we need better and more accessible data and, more importantly, a better models of working collaboratively. This article speaks to the necessity of a comparative view of yourself and an opponent in GEOINT. We illustrate the need for a comparative approach in education by examining GEOINT in the United States and the Russian Federation (RU). Our example is to illustrate that reliable GEOINT demands knowing both your opponent and yourself. The results of the study are more relevant to GEOINT educational goals and the comparative process than informative of RU GEOINT capabilities since there is little open source and explicit information about RU GEOINT doctrine. A: Ever since I was about 5 years old I’ve been fascinated by the natural world—learning the names of animals and plants; exploring small streams and wetlands; and reading tales from wilderness experiences. My friends and I would look at picture books of animals with maps of far off places, such as Australia and Africa, and memorize the species that lived there. It wasn’t until high school and my camping experiences in Scouting that I learned about ecology as a profession. We explored the validity of a survey measuring activity spaces for use in health research in a racially/ethnically diverse adult sample (n = 86) living in four Chicago neighborhoods. Participants reported on the location and visit frequency of 64 activities and wore a GPS data logger. We assessed the spatial congruence of survey- and GPS-derived convex hull measures and the number of GPS points within 100 m and 1000 m of survey locations. The survey-derived convex hull measures captured a small percentage (median = 35.9%) of the GPS-derived convex hull area. However, most GPS points were located within 100 m or 1000 m of home or reported survey locations (median = 73.4% and 92.6%, respectively). The original Digital Earth concept, formulated by Al Gore (1998), is essentially a virtual reality system. In this (imagined) system, users are able to freely explore all possible recorded knowledge or information about the Earth though an interactive interface. While we imagine such an interface primarily as visual for now, it can be expected that in the future other senses will be engaged, allowing for even more realistic virtual experiences. Even though ‘realism’ in the experience is desirable (i.e., it feels real), immersive experiences provided by visualization environments can go beyond reality, as they can be enhanced with queryable information. Of course one can also create fictitious experiences and simulations in such environments; including information about possible pasts (e.g., ancient Rome) and futures (e.g., a planned neighborhood); or spaces that we cannot (easily) directly experience (e.g., the Moon, Mars, other far-away spaces, under the oceans, core of the earth, etc.). Clio Andris, Xi Liu, Joseph Ferreira Jr.
Social and interpersonal connections are attached to the built environment: people require physical infrastructure to meet and telecommunicate, and then populate these infrastructures with movement and information dynamics. In GIS analysis, actions are often represented as a unit of spatial information called the social flow–a linear geographic feature that evidences an individual’s decision to connect places through travel, telecommunications and/or declaring personal relationships. These flows differ from traditional spatial networks (roads, etc.) because they are often non-planar, and unlike networks in operations systems (such as flight networks), provide evidence of personal intentionality to interact with the built environment and/or to perpetuate relationships with others. En masse, these flows sum to illustrate how humans, information and thoughts spread between and within places. An orientation/info session for UROC students will be held on Jan. 24, at 4:30 p.m. in 319 Walker Building. The GIS Coalition will meet Monday, Jan. 28 at 7:00 p.m. in 229 Walker Building. The Center for Landscape Dynamics will hold a brown bag lunch on Feb. 12 on “Making Science Relevant: how past graduate awardees of the award connect their research to communities and landscape management,” at noon in 319 Walker Building. The event is a way to learn more about the CLD-Graduate-Research-Award. Fifty-one years after the assassination of Martin Luther King Jr., the United States remains divided by issues of race and racism, economic inequality as well as unequal access to justice. These issues are stopping the country from developing into the kind of society that Martin Luther King, Jr. fought for during his years as a civil rights activist. The 2018, 2017, and 2016 issues of the GEOGRAPH newsletter are now available on the department website www.geog.psu.edu under News and Events. The 2018 issue is fully available online and the other are available as downloadable PDFs. GEOGRAPH is printed and mailed annually to alumni and friends of the Department of Geography. If you would like to be added to the mailing list, send your postal address to geography@psu.edu under the subject “add GEOGRAPH subscription.” From time to time, articles originally published in the GEOGRAPH will be highlighted here in DoG enews. The project primarily supports the thematic priority, Driving Digital Innovation, and also addresses Advancing the Arts and Humanities, Stewarding our Planet’s Resources, and Transforming Education. The goal is to demonstrate the potential that immersive technologies offer for all academic disciplines, but with a focus on environmental communication. In this article we present GeoTxt, a scalable geoparsing system for the recognition and geolocation of place names in unstructured text. GeoTxt offers six named entity recognition (NER) algorithms for place name recognition, and utilizes an enterprise search engine for the indexing, ranking, and retrieval of toponyms, enabling scalable geoparsing for streaming text. GeoTxt offers a flexible application programming interface (API), allowing for customized attribute and/or spatial ranking of retrieved toponyms. We evaluate the system on a corpus of manually geo‐annotated tweets. First, we benchmark the performance of the six NERs that GeoTxt provides access to. Second, we assess GeoTxt toponym resolution accuracy incrementally, demonstrating improvements in toponym resolution achieved (or not achieved) by adding specific heuristics and disambiguation methods. Compared to using the GeoNames web service, GeoTxt’s toponym resolution demonstrates a 20% accuracy gain. Our results show that places mentioned in the same tweet do not tend to be geographically proximate.